So let’s compare the works – how similar are they? Am AmMaj7/G# | Am7/G D/F# |. Harmony nerds corner: The fifth chord – the Fmaj7 in Stairway – is exactly that; the equivalently placed chord in Taurus is Fmaj7add#11. The equivalent of Stairway‘s D/F# in Taurus is arguably a fragment of D13/F# or an Amadd9/F#, being voiced F#BCE, but whatever name we choose to give the chord, the musical gesture and harmonic effect is extremely similar. Each chord change occurs at the same time in relation to the bar count – that is, the first four chords are played as half bars; the Fmaj7 is played as a full bar. In performance there are some similarities – these do not necessarily imply compositional copying, but will likely contribute to listeners inferring similarity if the recordings are played back to back. The works are performed at a near identical tempo (Stairway = 72BPM and Taurus=71BPM). They are performed in the same key of A minor. They are both performed on unaccompanied (or sparsely accompanied) acoustic guitar, played in the same fingerboard register (7th/5th fret). There are some differences, notably that Stairway‘s guitar part has an ascending melody in contrary motion to the descending bassline; Taurus‘s guitar part has no upper melody but instead features an unchanging ‘drone’ from the open B and E strings. In bar four the guitar parts are noticeably different; Stairway resolves from a G/B to an Am chord at the start of the bar, whereas Taurus implies Dm7 then Am7 in half bars. Here’s the audio (I claim fair use in reproducing these short excerpts as I contend that this blog represents ‘comment and criticism’). In Taurus we can see the recurring open string drone on beats 2 and 4 of the first two bars, and the distinctive (and contentious) chromatic descending bassline on beats 1 and 3 of the same bars. The notation shows only 8 bars; the audio excerpt includes the repeat, which has slight variations (form bar 4) in bar 8. 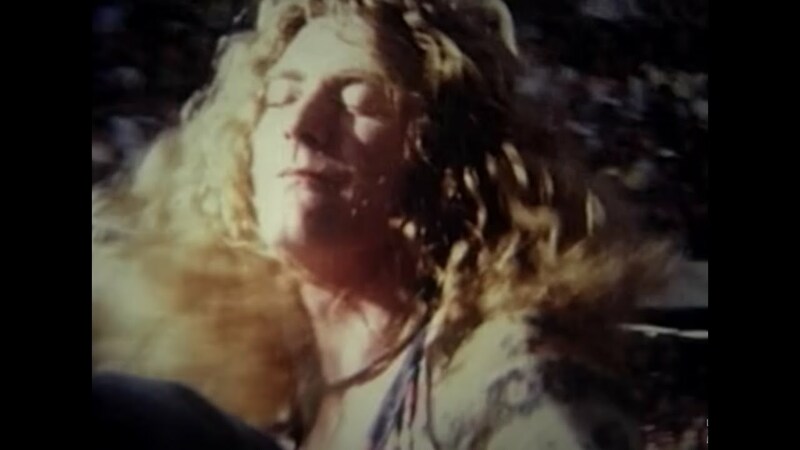 Stairway to Heaven lacks the open string drones on the back beats, and features an implied ascending melody on the first string, in contrary motion to the chromatic descending bassline. For guitarists who want to learn the intros, here are some interactive scores for Taurus and Stairway To Heaven that allow you to slow down the notes for practice purposes. Why do they sound similar? If the works are compared note for note in the transcriptions, there are more differences than similarities. That is to say, if you count up the notes, less than 50% of them occur at the same pitch at the same point in the bar. But this is a little specious as a method of comparison. And if you are prepared to change the time signature to a fast 3/4, you also get Chim Chim Cheree. So it’s fairly easy to demonstrate that the chord sequence is not original (to Taurus or to Stairway), and the Stairway side is already arguing this case. The Taurus side has clearly convinced the judge that even though the chord sequences are common, there are other similarities that, in his own words, ‘transcend this core structure’. But if not the chord sequence, what, musically speaking, are the similar elements? When we subtract chord sequences or the basslines, what remains that is similar? No lyrics are copied (because Taurus is an instrumental). 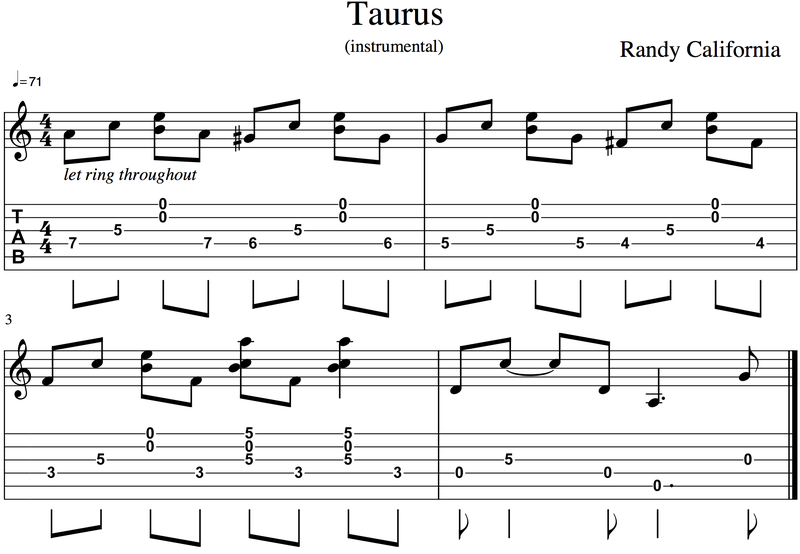 There is no top-line melody (in this section of Taurus) to speak of, so melody in the conventional sense has not been copied – though it might be possible to call the guitar part a melody of sorts. A note for note comparison, as we’ve seen, shows a minority of exactly consonant identical notes. So we are left with the undeniable argument that ‘feel’ of each song is remarkably similar when the audio is played. Why is this? When we hear a piece of music we don’t ‘hear the notation’ – we always hear it as a performance – that is, as an interpretation of the core composition by a performer. This means that recording or performance artefacts that are not necessarily inherent in the composition can contribute to the listener’s impression of similarity. So, for example, if you play two similar-sounding songs back to back, they will sound more similar if you play them at in the same key, or on the same instrument. In the US it is common for music copyright infringement cases to be tried by a jury, and even though jurors’ judgements may be guided by each side’s expert musicologist, they are still making ‘lay listener’ subjective decisions about the similarity of the works. Crucially, juries do not necessarily read music, so these decisions are not based on the underlying composition, but rather on a performance of it – juries respond to what they hear, which can be influenced by arguably non-compositional factors such as tempo, instrumentation and key. Law scholar Jamie Lund demonstrated the shortcomings of the lay listener test under experimental conditions, arguing that “playing the sound recording in a Composition Copyright case invites the jurors to make the wrong comparison, comparing the sound recordings, rather than the compositional elements underlying each recording.” (Lund, 2012). So, crucial to the upcoming case will be the question of whether the judge allows audio to played to the jury in the interests of evaluating the ‘concept and feel’. If he does, it is more likely that they will hear similarity (and infer copying). If he doesn’t (as in the Blurred Lines case), the musicologists will be left to influence the jury. And even though the Blurred Lines court did not hear the actual recordings, some law scholars (for example, Boston University’s Wendy Gordon) still take the view that the jury was misled. because they were not given the right guidance about the dividing line between the composition and the sound recording. There is, here, a core fundamental question that copyright case law has yet to answer consistently: what is the difference between a musical work and a performance of that work? Without a clear definition of what we consider to be the manifestation of a composition, we are left with seemingly arbitrary verdicts, subjective juries, manipulative use of expert witnesses, and musically confusing case law. Meanwhile, musicians and songwriters have no clarity about how to respond to creative evolution of the art form – what can be copied, and where are the boundaries between influence, homage, adaptation and plagiarism? I remember one of my BIMM classmates doing a presentation on this similarity, and he claimed that Zep had deliberately employed the same session musician (flautist, I think) to play on Stairway as had played on Taurus because they were going for the same vibe. Obviously, that doesn’t mean infringement took place any more than if I booked Carol Kaye because I like Pet Sounds, but if it’s true I’m surprised I haven’t heard anyone mention it. “…he claimed that Zep had deliberately employed the same session musician (flautist, I think) to play on Stairway as had played on Taurus because they were going for the same vibe.” I highly doubt this is correct. I’m pretty sure that the “flute” at the beginning of STH is John Paul Jones on a Mellotron. 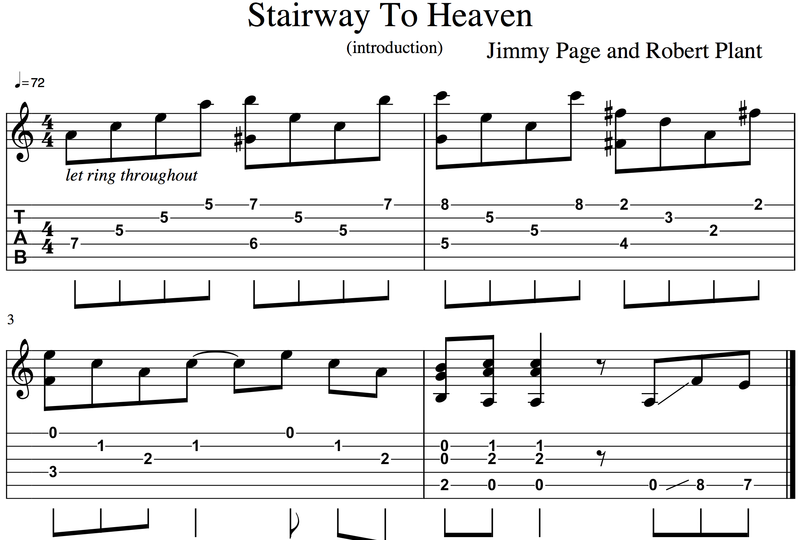 Yup, that’s what the Wikipedia article on the song says: https://en.wikipedia.org/wiki/Stairway_to_Heaven.